From hybrid systems to innovative tailgates, manufacturers have added interesting and innovative features to their popular trucks, along with a good mix of models and trim levels to meet the needs of every buyer. The heavy-duty truck market may have some major updates coming in 2020; for 2019, here is a look at the updates from each of the major manufacturers. Another company that has targeted the broad pickup purchasing market is Ram, which has focused for 2019 on introducing a variety of models and trim levels for its popular 1500 series. It has also introduced an interesting new electrical system that essentially makes the truck a hybrid – the eTorque feature. Ram calls the system a "mild hybrid" system that is paired with the second-generation 305-hp 3.6L Pentastar V6 and 395-hp 5.7L HEMI V8. eTorque replaces the traditional alternator on the engine with a belt-driven motor generator unit that performs several functions. The motor generator unit works with a 48-volt battery pack to enable quick and seamless start/stop function, short-duration torque addition to the engine crankshaft in certain driving situations and brake energy regeneration, which improves responsiveness and efficiency. The benefits are quick to be seen – the eTorque gives the V6 up to 90 lb.-ft. more torque, while the HEMI gets up to 130 lb.-ft. from the system. Updated TorqueFlite eight-speed automatic transmissions are also available. "The all-new 2019 Ram 1500 delivers a no-compromise approach to the full-size truck segment with strength, durability, technology and efficiency," said Mike Manley, Head of Ram Brand. "The Ram 1500 offers truck buyers leading-edge innovation with 225 pounds of weight reduction, 12,750 pounds of towing capability, a stunning Uconnect 12-inch touchscreen display and active systems that improve fuel efficiency and assist drivers." The V6 and V8 powertrains in the 2019 Ram 1500 also reduce fuel consumption with an Interactive Deceleration Fuel Shut Off (iDFSO) feature that pauses fuel flow to the engine cylinders when the vehicle is decelerating. For the 2019 model year, the iDFSO feature is improved to be active in third gear and higher. 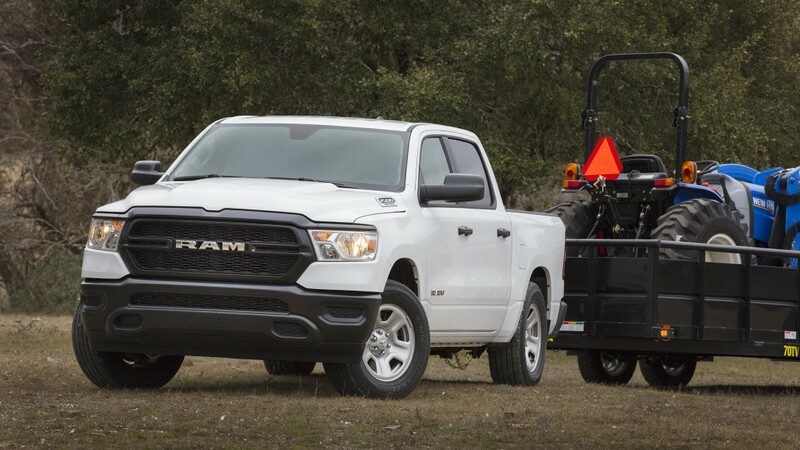 Ram has brought a variety of models to the market, including the Tradesman, which is designed for businesses, construction and commercial fleets, the company states. Canadian buyers have made Ram's Sport trim one of the most popular truck models in the country, so the company has introduced an exclusive version for Canada. At the top of the lineup is the Laramie Longhorn edition, designed with power, performance and luxury in mind. On the technology side, Ram has put a lot into the 1500, including its fourth-generation Uconnect system and 12-inch reconfigurable touchscreen display featuring split-screen capability for dual-application operation. An available navigation system accommodates one-step, voice-controlled destination entry and enhanced 3D navigation map graphics. Safety features in the 2019 1500 include standard or available features like Adaptive Cruise Control, blind spot monitoring, Forward Collision Warning-Plus, LaneSense Lane Departure Warning-Plus, and various others. Ford has placed a focus in the 2019 model year of bringing new updates and improvements to its venerable and popular F-150 pickup, including the addition of a diesel engine option for the first time. The company has also relaunched its popular Ranger midsize pickup, and announced plans for a major update across its offerings for 2020. Diesel fans got their wish early in the model year with the addition of the Power Stroke diesel option to the F-150. The 3.0L diesel shares technology with the 6.7L Power Stroke offered in the larger Super Duty diesels. This powerful V6 generates 250 hp and 440 lb.-ft. of torque. Peak torque comes at 1,750 rpm with strong torque delivery continuing throughout the rpm range, ideal for towing or hauling heavy loads over long distances. Standard in the F-150 is the 3.3L V6 paired with a 6-speed automatic transmission; also offered are a 2.7L EcoBoost V6 and 5.0L V8. At the top of the range, the F-150 Limited is powered by the high-output 3.5L EcoBoost that was previously only available on the high-performance Raptor. All but the 3.3L are paired with a 10-speed automatic transmission. The F-150 offers a variety of trim levels from the XL up through the luxurious Limited, giving every buyer a truck style that will fit their needs whether it's jobsite toughness or daily driving comfort and style. Also added in 2019 is a re-introduction of the Ranger nameplate in the midsize segment. Built around a high-strength steel frame backbone, the Ranger is fitted with a 2.3L EcoBoost engine and 10-speed automatic that make it rugged, maneuverable and affordable for owners. Looking forward, Ford fans can expect plenty of excitement as the company plans to refresh its big names. The F-150 is expected to get a major redesign for 2020, for example, and the company has suggested a hybrid powertrain may be part of the update; other segments of Ford's truck portfolio are also expected to be updated. GMC's flagship Sierra 1500 has been redesigned from the ground up with a longer wheelbase and a crew cab body offering more rear legroom than the previous version of the truck. It also has a number of exclusive features that GMC says are industry-firsts, along with a wide range of engine options to make sure the truck is ready to roll for whatever owners may need it for. Sierra's MultiPro tailgate is brand-new and exclusive; it offers six functions and positions to provide enhanced second-tier loading and load-stop solutions, a standing workstation and easier access to items in the cargo box. This multifunctional tailgate offers proven strength and durability, having undergone more testing and validation than any tailgate in GM's history. Sierra is the first and only truck to offer the MultiPro Tailgate, providing premium truck customers the ultimate flexibility. GMC is also offering the CarbonPro carbon fibre cargo box, which was designed to increase durability, efficiency and functionality while offering dent, scratch and corrosion resistance. The Sierra has been built with lighter materials that have shaved more than 400 pounds off the weight of the truck while keeping it strong and functional for hard work. It is available in regular cab, double cab and crew cab, all with available 4-wheel-drive. Six engine and transmission combinations are available on Sierra 1500: a 4.3L V6 or 5.3L V8 are fitted with Active Fuel Management and a six-speed automatic, while a new 2.7L turbo engine is also equipped with Active Fuel Management and an eight-speed automatic. GMC offers a new 5.3L V8 or 6.2L V8, both with Dynamic Fuel Management – which expands cylinder deactivation capability with 17-cylinder activation combinations to optimize performance – and eight-or 10-speed automatic transmissions respectively. Finally, a new 3.0L inline-6 turbo diesel will be paired with a 10-speed automatic transmission. A variety of models and trim levels are available, including the newly added AT4 which offers solid off-road capability and innovative technology paired with premium features. It's lifted and set on a 4WD platform with all the features needed to handle rugged terrain. The luxury-level Denali comes with a suite of technologies including a multi-colour Head-Up Display and rear camera mirror, as well as ride control and other improvements. Toyota continues to focus on both midsize and full-size pickups with 2019 upgrades to both the larger Tundra and the smaller Tacoma. The company has a variety of models available, up to TRD Pro editions in both sizes, and a collection of trim levels that meet the needs of any customer. "We believe pickup truck owners shouldn't have to sacrifice comfort and features for capability, which is why we designed the Toyota Tundra to blend power and durability for the jobsite with comfort and refinement for the weekend getaway or epic road trip," said Cyril Dimitris, vice president, Toyota Canada Inc. "The Tacoma combines remarkable performance with impressive comfort, amenities and technologies, plus industry-leading safety systems to make sure it's ready for anything – including hauling gear, towing a trailer or taming trails." At the heart of the Tundra is Toyota's proven 5.7L i-FORCE V8 engine, delivering up to 381 horsepower and 401 lb.-ft. of torque, and paired to a six-speed automatic transmission with sequential shift mode operation. All models with the 5.7L engine are also standard equipped with a 144L fuel tank, lock-up torque converter, trailer brake controller, and Toyota's Tow Package. Four-by-four models feature a one-touch 4WD mode with auto limited slip rear differential, active traction control, and trailer sway control. Some models come with the 4.6L i-FORCE V8. This engine generates 310 peak horsepower and up to 327 lb.-ft. of torque, providing even better fuel efficiency. For the Tacoma, a 3.5L V6 provides up to 278 hp and 265 lb.-ft. of torque, all equipped with advanced technologies to maximize power and efficiency while minimizing emissions. All models with the 3.5L engine are also standard equipped with a Class IV weight distribution tow hitch, 7-pin wiring harness, and Trailer Sway Control technology. For those seeking maximum fuel efficiency, some models are built around a 2.7L four-cylinder engine that generates up to 159 hp and 180 lb-ft of torque. Depending on model, the Tacoma features either a six-speed manual transmission or six-speed automatic super electronically controlled transmission with lock-up torque converter. Both trucks are outfitted with Toyota Safety Sense P – a bundle of active safety technologies included as standard equipment on 95 percent of all new vehicles Toyota sells in Canada. TSS P features the Pre-Collision System with Pedestrian Detection, Lane Departure Alert with Steering Assist, Automatic High Beams, and Dynamic Radar Cruise Control. These work together to enhance driver capabilities to mitigate collisions, stay in lane, and see at night. Other safety systems include the Toyota Star Safety System, eight airbags, a backup camera, and a direct tire pressure monitoring system. For performance enthusiasts, the TRD packages on both trucks offer sport, pro and off-road options that add performance, style and capability in a variety of situations, including rugged sites. Technology improvements include everything from premium audio, additional safety systems such as blind spot monitoring and more, along with a variety of other options. Fuel efficient engines and more capacity combine with lower pricing models for Chevrolet's 2019 Silverado, the company has announced. "The next-generation Silverado [offers] more interior and cargo space, increased towing and payload capabilities, and a lower starting price on our highest volume trucks," said Doug Kenzie, national marketing manager, Chevrolet Trucks in Canada. For example, Chevrolet says the 2019 Silverado LT crew cab 4x4 with a short box is less expensive than the previous model, even with new standard equipment that includes a 2.7L turbo engine with 22 percent more torque than the 4.3L V6 it replaces, an eight-speed automatic transmission, stop-start technology and others. For customers seeking full-size truck capability and high value, the Work Truck (WT), Custom and Custom Trail Boss trims offer two proven engine and transmission combinations. Standard is the 4.3L V6 with Active Fuel Management and a six-speed automatic transmission SAE-certified at 285 hp and 305 lb.-ft. of torque; customers can opt for the 5.3L V8 with Active Fuel Management and a six-speed automatic transmission (355 hp/383 lb.-ft.). In the high-volume heart of the truck market, the LT, RST and LT Trail Boss trims balance technology, efficiency and performance. Standard for LT and RST is the all-new 2.7L Turbo with Active Fuel Management and stop/start technology; paired with an eight-speed automatic transmission generating 310 hp and 348 lb.-ft.
Standard on LT Trail Boss and available on LT and RST, an updated 5.3L V-8 with Dynamic Fuel Management and stop/start technology with an eight-speed automatic transmission offers 355 hp and 383 lb.-ft. The all-new Duramax 3.0L Turbo-Diesel with stop/start technology and a 10-speed automatic transmission will be available on LT and RST in early 2019. Premium truck buyers who are looking for plenty of high-end features can go with the LTZ and High Country, with top levels of performance and technology. Standard is the updated 5.3L V8 with Dynamic Fuel management, while the Duramax 3.0L diesel and an updated 6.2L V8 with Dynamic Fuel Management and stop-start technology, paired with a 10-speed automatic transmission to push out 420 hp and 460 lb.-ft. of torque, are both available.